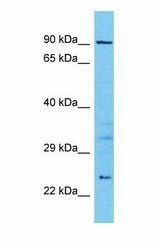 CLC-4 antibody LS-C480178 is a biotin-conjugated rabbit polyclonal antibody to human CLC-4 (CLCN4). Validated for WB. CLCN4 / CLC-4 antibody was raised against synthetic peptide directed towards the N-terminal region of Human CLCN4. 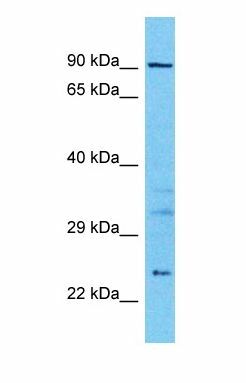 Western blot of CLCN4 Antibody with human 721_B Whole Cell lysate. This image was taken for the unconjugated form of this product. Other forms have not been tested.